IGNOU Master, Bachelor, PG Diploma, Diploma and Certificate Program Admissions/Online Admission System at IGNOU: Indira Gandhi National Open University (IGNOU), as a part of its ongoing efforts for offering learner-friendly services, has launched an Online Admission System (OAS). Through this facility, prospective learners shall be able to submit their application forms online and receive instant confirmation for successful submission of their application form through email as well as through SMS. There is provision for payment of Programe Fee on-line through Credit/Debit cards by using On-line Payment gateway. This facility shall be available for the ongoing July 2017 admission session for all the 148 academic programs at Master, Bachelor, PG Diploma, Diploma and Certificate level currently on offer. The Indira Gandhi National Open University (IGNOU) has invited applications from eligible candidates for admission to more than 150 programmes for January 2018 session. Interested candidates can apply through the official website latest by December 31. About IGNOU: The Indira Gandhi National Open University (IGNOU), established by an Act of Parliament in 1985.The University began by offering two academic programmes in 1987, i.e., Diploma in Management and Diploma in Distance Education, with strength of 4,528 students. 1. If you are a first time applicant you are advised to click the available programme tab on the homepage of the Online Admission System and select the desired programme and carefully read the details of programme including eligibility criteria, fee details, duration, etc. You are also requested to download the Common Prospectus 2017-18 and read carefully the rules of the University (Section 06) as mentioned in the common prospectus. You may also read section 1, 7, 8, 9, 12 and 13.
i) Click on the button "REGISTER YOURSELF" that appears in the applicant login area and fill the required registration details. ii) Remember, while choosing your User Name it must be in between 8 to 16 characters. iii) While choosing your password it must be alphanumeric and between 8 to 16 characters long. iv) After filling the mandatory information click the "SUBMIT" button. v) Your username will be instantly sent to you via e-mail and SMS. 2. Remember your Username and Password for subsequent login. 3. If you have already registered i.e you are an existing user click the "LOGIN" button. 6. All the documents being uploaded should be self attested. Once you have uploaded the document, click the next button you will get the Form preview option. Save/Print your form for future reference. 7. After successful submission of the online application you are requested to visit your selected RC with original documents for verification. Note: Furnishing of incorrect information/suppression of information would lead to rejection of application form as per IGNOU Rules. 1. Click on "LOGIN" button from the homepage of Online admission system and then login with your UserName and password by clicking the "LOGIN" button given on the login screen. a. If your subjects are different than the subjects mentioned; click the "OTHERS" check box. b. For those with qualification of graduation and above, in the field "Board Code" select "9999". a. Payment by Debit/Credit Card: You have to select Debit/Credit Card option to pay the programme fee and follow the online instruction to complete the payment of fee. After successful payment, you will be able to print/save the payment confirmation slip. b. Payment by Net banking (UBI): If you have a UBI net banking account select this option. You will be redirected to your bank website. c. Scanned copy of Age Proof. Once you have uploaded the document and click the "NEXT" button you will get the Form Preview option. Save/Print your form for future reference. for more details click on the give below link.. The online admission facility can be accessed on the website of the University atwww.ignou.ac.in or by visiting https://onlineadmission.ignou.ac.in/. 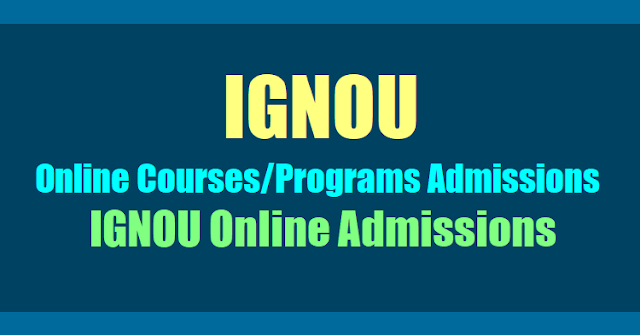 send email to online_admission@ignou.ac.in, in case of any difficulty.